Telling a story that simultaneously takes places in three different time periods is an ambitious undertaking to say the least. 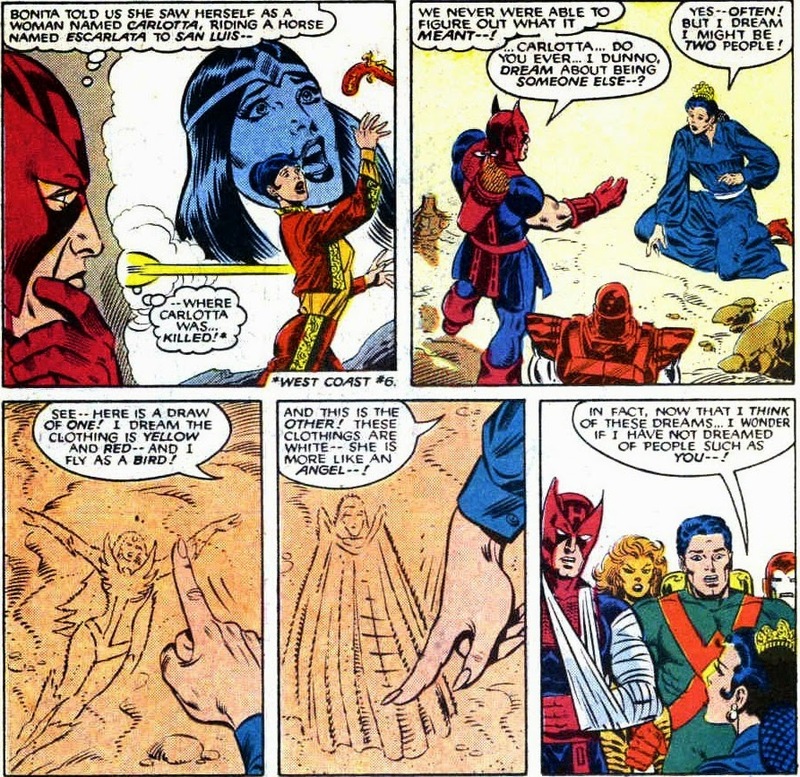 Englehart carefully plotted his tale to make sure events from past, present and future would interconnnect. But, to make sure the readership could keep track he still added a recap page to every issue. Nowadays, every single Marvel comic starts with one irregardless of whether they need it. But most creators approach an issue like they're writing an episode of a TV show. 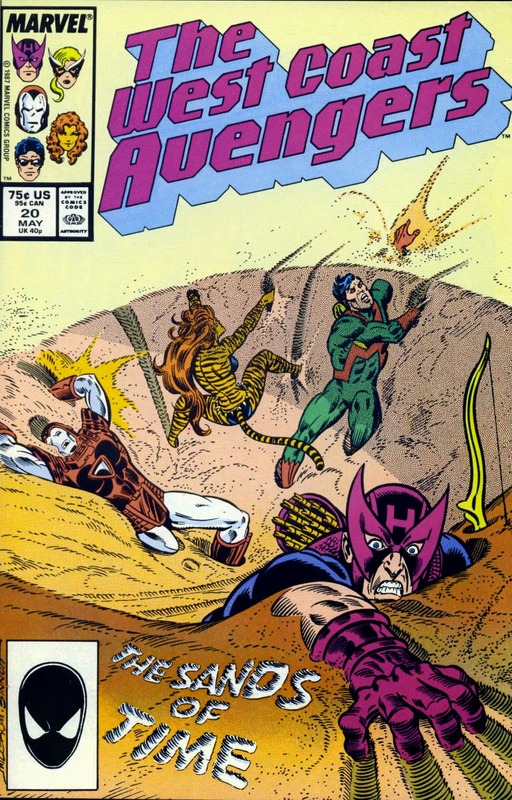 So, without further ado... "Previously, on West Coast Avengers...". 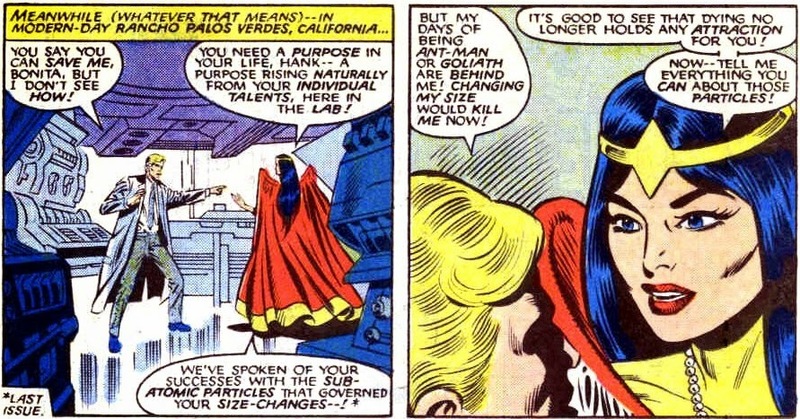 Starting with the present, Bonita "Firebird" Juarez had arrived at the Avengers Compound in time to prevent Hank Pym from blowing his brains out. In her new guise as La Espirita, she was trying to save his soul by inspiring him to find a new purpose in life. Which is a bit daunting if you consider the man had already reinvented himself at least four times by then: from Ant-Man to Giant-Man to Goliath and, most recently, Yellowjacket. Still, the religious La Espirita believed in the beauty of divine redemption and had Hank walk her through his many different guises and powers. "Now... tell me everything you can about Pym particles!" Asking a scientist to tell you everything about their single greatest discovery? Oh Bonita, you'll be needing a time machine to survive that lecture. After listening to Pym explain the ins and outs of the size-changing particles he discovered, he also demonstrated its effect on living beings by growing and shrinking an ant Bonita had brought for the occasion. Unfortunately, the insect didn't survive the rapid changes. So much for your holy mission trying to save innocent life, sister Espirita... Still, their search for Pym's purpose continued while in the past the Avengers just left 1870s Arizona without Mockingbird. Understandably upset after seeing his wife get kidnapped by the Phantom Rider, the Avengers' leader lost his cool a little. He wanted to go back, forgetting for a moment the time machine that got them stranded in 1876 in the first place was defective: it could only go backwards. "And anyway, Mockingbird's an Avenger! She can take care of herself!" Well, sufferin' suffragette Tigra, I do hope you're right... How's Bobbi doing anyway? After getting knocked out by the Phantom Rider, she was dragged to his hidden cave. There, in typical Englehart fashion, Lincoln Slade waxed poetically for a page and a half about his sad origins. He felt trapped as the Phantom Rider, a role forced on him by the Comanche. 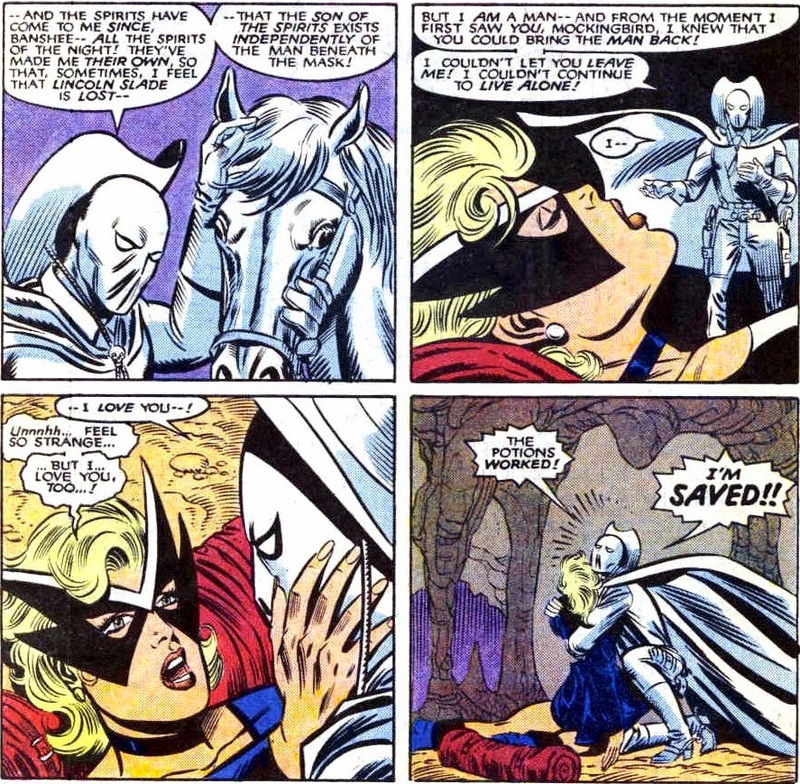 When he encountered Mockingbird, he was immediately smitten and decided he just had to have her. To make sure she'd find him equally irresistible he slipped her the proverbial mickey: a mystical Comanche love potion that should make Bobbi love him and, ever so conveniently, have her forget all about her previous life as well. "The potions worked! I'm SAVED!!" Now, I could go off on a tangent about just how morally reprehensible Hamilton Slade's actions were. Sure, he might be mentally unbalanced and yes, back in the 1870s women had about as many rights as a horse no matter what Dr. Quinn: Medicine Woman wants you to believe. But there's no doubt we can all agree that kidnapping someone and taking advantage of them while they're drugged and unable to defend themselves is wrong. No matter how goofy you dance to this this tune. Dazed and madly in love, Mockingbird prepared to accompany the Phantom Rider back to his hometown of Lordsburg where he works as the local sheriff. She also spotted a rusted, metal object in the cave that looked an awful lot like one of Hawkeye's arrowheads. Fascinated, though unsure why, she decided to hang on to it even as they fought off Two-Gun Kid and Kid Colt who had come looking for them. Phantom Rider and Mockingbird escaped and headed for Lordsburg where Slade began preparations for a quicky wedding and Bobbi kept playing with that arrowhead. "That arrowhead... It looks like something Hawkeye would have used!" Speaking of Hawkeye and the others... By now they had figured out their time jump had landed them back to 1776, mainly because they landed near a contingent of Spanish soldiers who immediately took them for British spies and got ready to shoot them. Yes, hard to believe as it is, when the American founding fathers signed the famous declaration of independence, both Spain and Great Britain were still actively trying to take control of what they considered their colonies. Unfortunately for the Spanish, determination and a handful of muskets won't exactly give you the upperhand against a nimble werecat, a man in high tech combat armor, and an ionic being eager to prove himself. 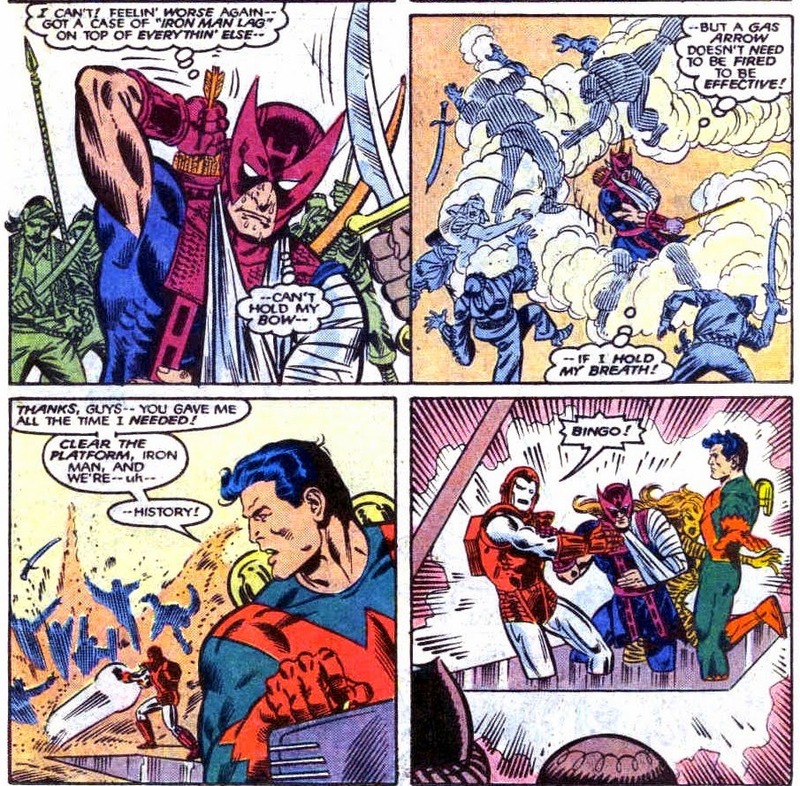 Yes, Wonder Man's ego was acting up again. 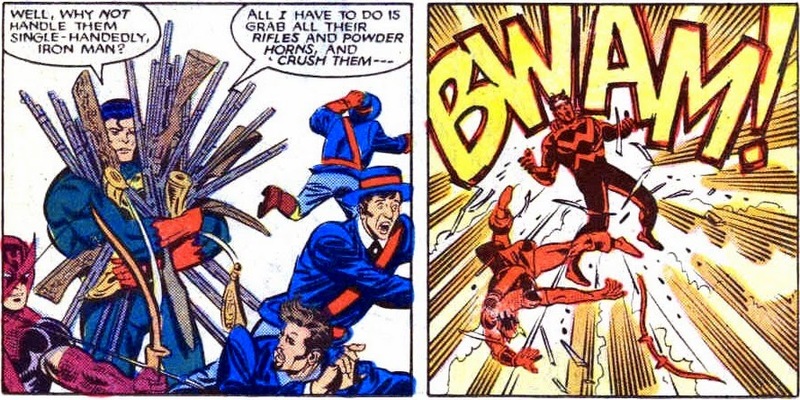 Eager to upstage Iron Man, he showed off by quickly disarming the soldiers and destroying their weapons. "All *I* have to do is grab all their rifles and powder horns and crush them..."
...Simon Williams, ladies and gentlemen. Former owner of a munitions factory, yet totally unaware anything loaded with gunpowder is essentially an explosive waiting to happen. No wonder Stark Industries outperformed you at every turn. 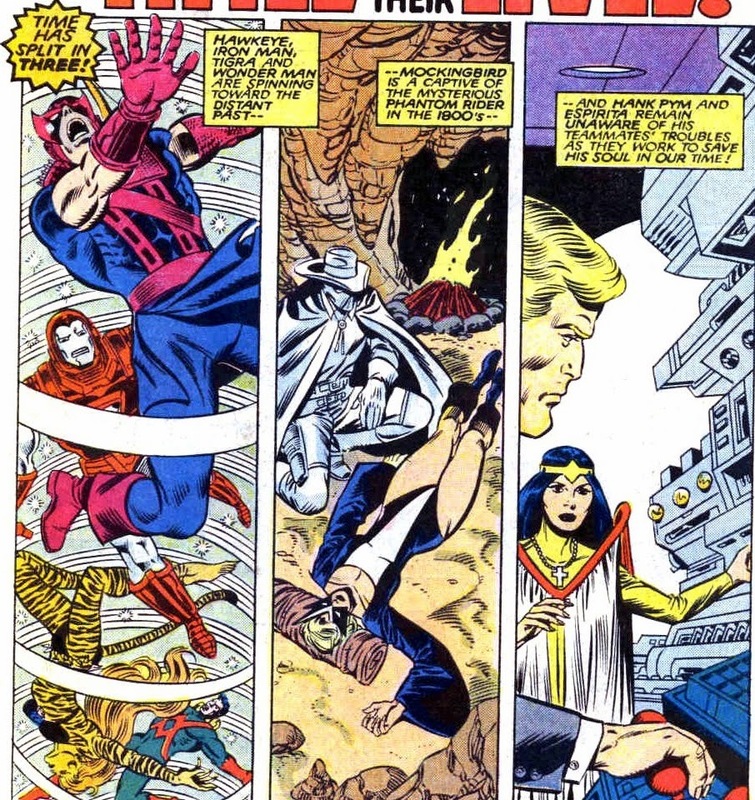 Wonder Man wasn't hurt by the explosion, the same couldn't be said for the not quite as indestructible Hawkeye. Suffering rather severe burns, Clint was taken to a nearby cave to recuperate. There, they encountered a young missionary called Carlotta Valdez who had witnessed their fight with the Spanish and offered her medicinal salves to help soothe Hawkeye's burns. 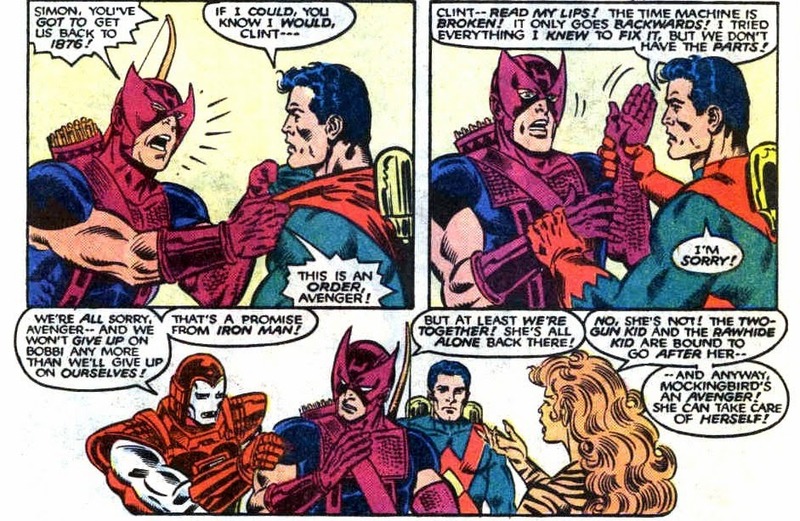 Though in considerable pain, seeing the woman reminded Clint of a conversation he had with Firebird not too long ago (relatively speaking, of course). "Carlotta, do you ever dream about being someone else...?" Because with mad sand drawing skills like that, you could make a living as an artist instead of putting home made salve on masked gringo burn victims. Figuring there was a link between Carlotta and Bonita "Firebird" Juarez, the archer took perhaps the longest shot of his career. Asking Carlotta for more of the petticoat she'd used to bandage his wounds, he took one of his inkjet arrows, snapped off the head and wrote a little message. Even if you have to pass it on to future generations!" Ever accommodating, though she believed the poor man was hallucinating, Carlotta took the message and promised to keep it in her family bible. 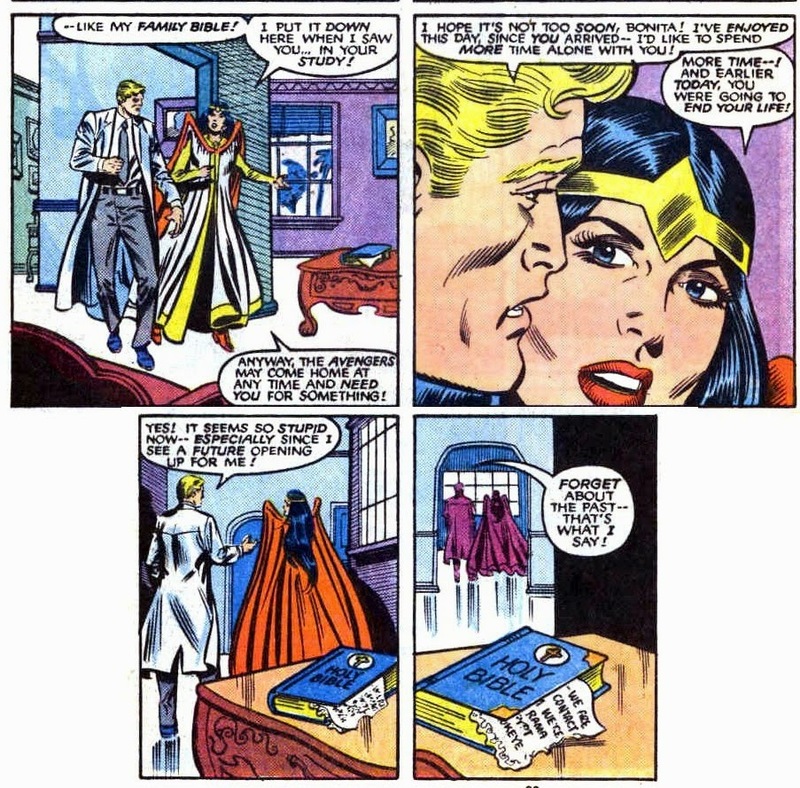 When she left, Hawkeye caught an earful from Tigra who was furious with him for what he'd done. Clint hadn't told Carlotta the whole story, or even half of it. In Firebird's vision, the woman was eventually shot in the back during a raid. Greer figured he could have at least warned her, just sending her off to die wasn't fair. "Nobody ever said life was fair, Tigra! If it were, we wouldn't be here and my wife wouldn't be in 1876. So let's fly this thing to present-day Egypt so we can get to ancient Egypt." Well said, Hawkeye... We all have our crosses to bear in life and sending someone to die in order to give others a fighting chance to live is exactly the kind of tough call a leader has to make... and live with. But still, tossing that spent ink arrowhead to the side of the cave is just bad behavior. Who knows who might pick it up later? And with that, the team's long schlepp to Egypt began. It took the Jews over 40 years to get out of the country, the Avengers got in within 24 hours. And that's including a brief pitstop in Philadelphia to get Hawkeye some proper medical care before they started their Atlantic crossing. While in the city of brotherly love, they almost ran into Doctor Strange and Clea who were time travelling as well. Strange could have sent them all home, literally with the flick of his wrist... But alas, they had to do it the hard way. 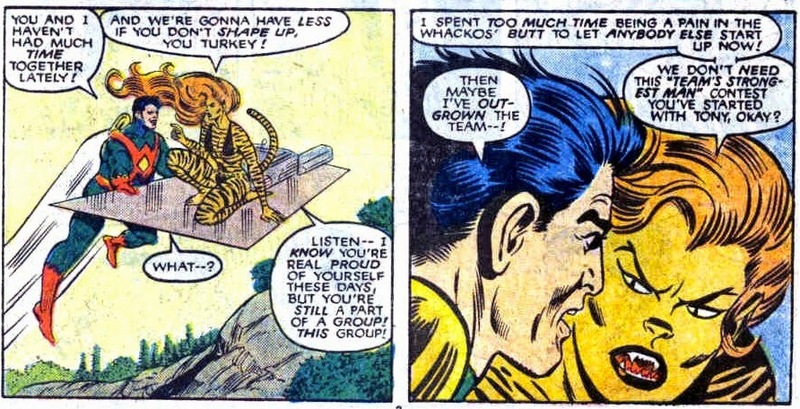 Still, all those hours of flying gave Tigra ample opportunity to set the snotty Wonder Man straight. "We don't need this "team's strongest man" contest you started with Tony, okay?" - "Then maybe I've outgrown the team...!" "A gas arrow doesn't need to be fired to be effective! ... If I hold my breath!" "Time? Time is an illusion. I live in the future... I live in the past. I must stop myself from my sins as Kang to come. Must keep myself from Mantis... The Celestial Madonna! Must sleep!" 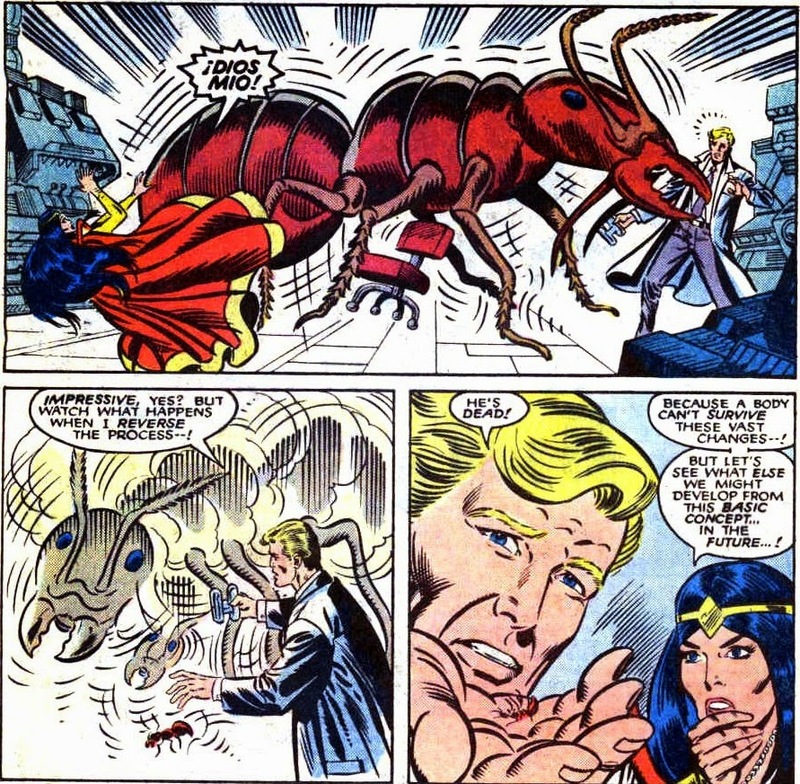 Well, guess it wouldn't be a Steve Englehart Avengers saga without at least paying lipservice to Steve's favorite character Mantis. 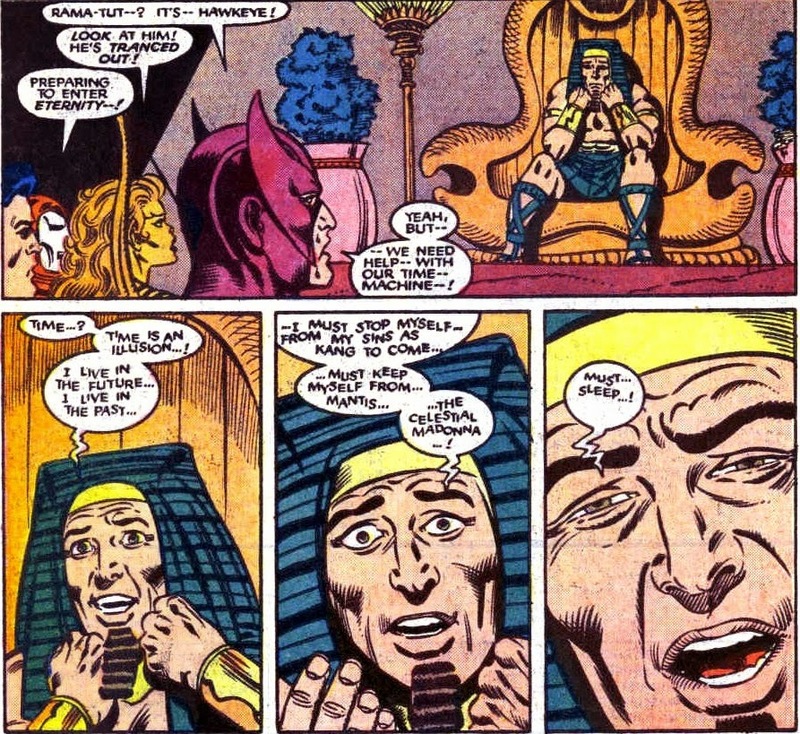 Rama Tut's rambling refered to Englehart's earlier work on Avengers, specifically the Celestial Madonna arc. In this ambitious mid-1970s storyline, cosmic forces deemed former Vietnamese prostitute Mantis the perfect human (ow, Steve!). She was then married by Immortus, another future version of Kang, to the leader of the Cotati... A walking, talking alien plant that had assumed the form of Mantis' dead lover the Swordsman. Yeah, that actually happened... The 1970s were a confusing time for all of us. 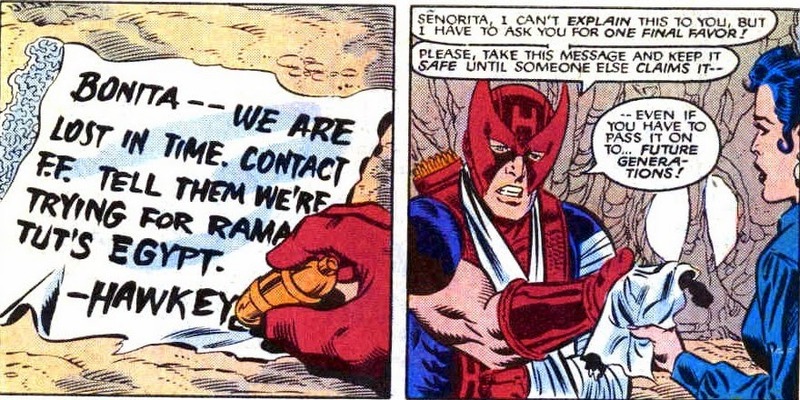 In his present state of mind, or lack thereof, Rama Tut couldn't help the Avengers. That's why he suggested they went back a bit further in time, to his first reign. Back then he was still coherent enough to know how to fix a time machine. Taking his advice, and picking up Hawkeye who by then had all but collapsed, the Avengers made one final temporal jump only to be instantly blasted from behind by Rama the Younger. Tut might have been smarter in the past, but he was also a homidical, evil nutjob. "Nothing can halt the destiny of pharaoh Rama-Tut! No matter how many I have to kill!" Talk about being in a trans-temporal pickle. 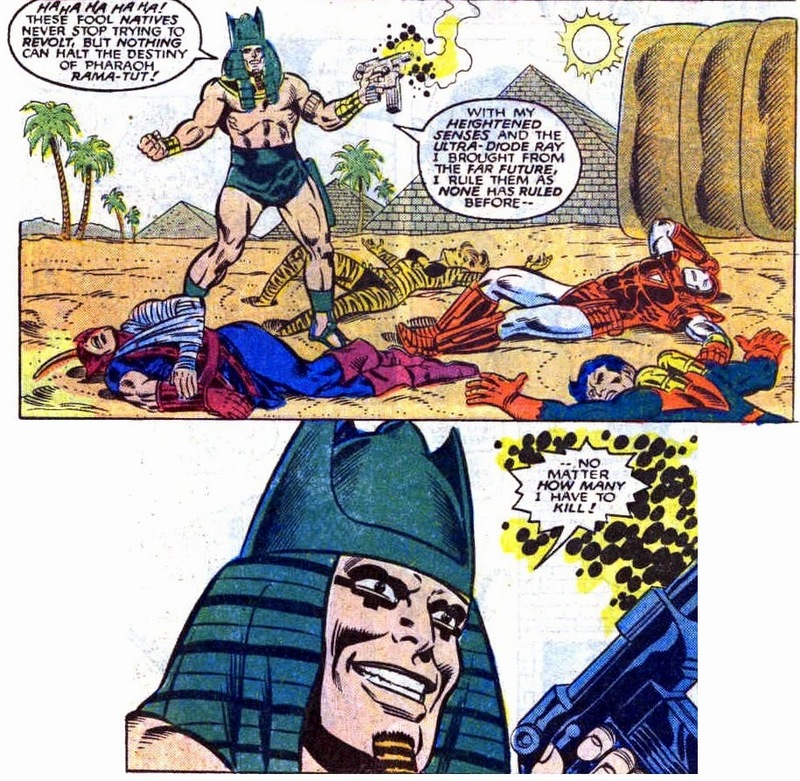 All hope seemed lost, for both the Avengers in ancient Egypt as well as Mockingbird who was about to become a madman's blushing bride... And no one in the present knew what was going on or seemed even remotely worried. "Forget about the past... that's what I say!" Just want to say I love these in-depth looks at these team book storylines. Is there a list you could post of all your multi-part series on these sites, Jef? By my count you've done about 3 FF storylines, 2 or 3 Avengers, 2 Alpha Flights, one X-Men, one Defenders, and now a WCA story in progress. Tremendous fun. (now just waiting for a New Mutants series once your done with this one). Looks like there's at least some stuff I didn't catch the first time around. Thanks for the overview, I'll be checking that stuff out (Doc Strange, Spider-Woman and Marvel Two-in-One sound like some nice reading).